Mind-blowing 3000mm zoom. 4K Ultra HD video. RAW (NRW), macro, time-lapse and so much more. Imagine being able to zoom far beyond the reach of standard telephoto lenses, to capture not just the moon, but the craters, peaks and valleys of its surface. Imagine being able to view the International Space Station in flight, even the rings of Saturn—not with a telescope, but with a one-of-a-kind Nikon camera. Introducing the COOLPIX P1000, the most extreme zoom Nikon ever, and a game-changer for birders, sports and wildlife enthusiasts, travel photographers and even those aspiring to venture to the moon and beyond without leaving their backyard. This isn't super zoom, it's extreme zoom. A 3000mm equivalent NIKKOR ED glass lens—the most powerful lens ever used on a COOLPIX camera—opens a new world of shooting possibilities. When shooting with extreme zoom power, tiny camera movements are amplified. 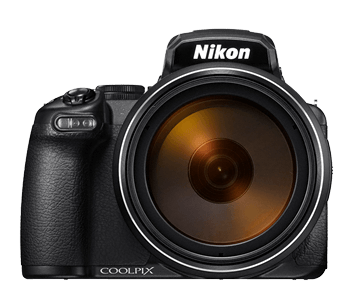 The COOLPIX P1000 uses a Dual Detect Optical Vibration Reduction system to stabilize both horizontal and vertical movements. Harness the flexibility of the COOLPIX P1000's incredible lens and high quality image sensor to create amazing video content in 4K UHD (3840 x 2160 at 30p) with true stereo sound. For greater control of your videos, manual mode allows you to adjust focus, exposure and more during recording. When it comes to videos, the COOLPIX P1000 won’t leave you wanting. It includes an HDMI port for recording and playback to an external monitor, a microphone jack for optimal sound capture, and a hot-shoe for mounting even more filmmaking accessories. Create extraordinary fast-motion footage with the COOLPIX P1000’s time-lapse and superlapse recording modes. Time-lapse combines still images shot at customizable intervals into a 10 second video, while the Superlapse feature can capture video at speeds of 2x, 4x, 10x, 20x, and 30x. The COOLPIX P1000’s miraculously compact lens design puts the power of a massive professional super telephoto lens into a compact bridge zoom camera design along with convenient external control features like a smooth focus control ring, snapback subject acquisition checking and AF/MF switching; and some of NIKKOR’s most advanced lens technologies. The COOLPIX P1000’s smooth operating control ring provides next-level operation, enabling you to intuitively adjust focus in MF mode or exposure, white balance or ISO in AF mode right from the lens barrel without having to look away from the viewfinder. With the press of a button, the COOLPIX P1000 zooms out so you can easily recapture distant subjects that may have moved out of frame. Release it and your focal length snaps right back to where it was. Use the extreme zoom power of the COOLPIX P1000 on close subjects for macro photography and reveal the smallest details. Focus as close as 1 ft. from your subject. The COOLPIX P1000's fast f/2.8 maximum aperture, backside-illuminated image sensor, high ISO capability and EXPEED 4 image processing power through low light situations. Comfortably compose your shot with the COOLPIX P1000’s crystal clear, 0.39-inch 2.36 million dot electronic viewfinder, perfect for handheld shooting. Not only does the 3.2-inch 921,000 dot LCD display offer brilliant composing and playback, but its Vari-angle functionality lets you frame shots from tricky high or low angles with ease. Connect the optional dot sight, an external flash or strobe, microphone, remote and more to the COOLPIX P1000's full-size hot-shoe. The front and rear grips on the COOLPIX P1000 were specially designed to enhance holding and minimize fatigue as a result of extreme telephoto shooting. Show off the COOLPIX P1000’s incredible zoom shots instantly on social media thanks to Nikon’s SnapBridge app for iOS® and Android™. SnapBridge pairs easily with Bluetooth/Wi-Fi® enabled Nikon cameras like the COOLPIX P1000 and allows you to send photos from the camera straight to your smartphone, then edit and share like normal. The COOLPIX P1000 has a host of automatic functions to help you capture great photos from day one. Scene modes optimize settings for a selected scene type such as portrait, sunset, landscape, night and more, while auto ISO, exposure and white balance ensure great, hassle-free results so you can focus on getting the shot. Take the guess work out of shooting tricky far off subjects. Moon mode automatically compensates for low light astrophotography while the advanced bird-watching mode optimizes the camera’s settings for capturing elusive creatures. Stylize your shots with easy-to-use filters organized in five groups: Light, for brightening color, Depth for calming atmosphere, Memory, for creating old-fashioned looks, Classical, for traditional photo effects and Noir, a collection of monochrome tones. Find the right look for any scene with Nikon’s Picture Controls. Shoot in Standard, Neutral, Vivid or Monochrome and find a style that’s all your own. Keeping distant moving subjects in frame is tricky. 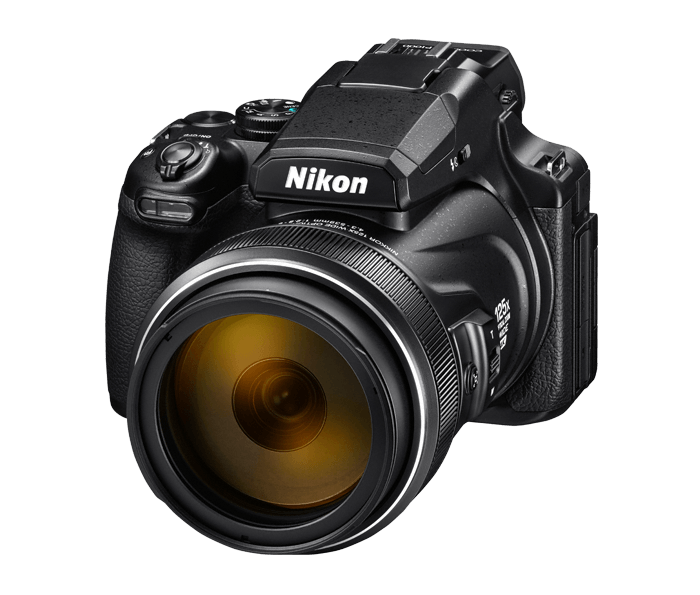 The DF-M1 Dot Sight attaches to the COOLPIX P1000’s hot-shoe and assists in acquiring distant subjects by acting as a zoomed-out targeting device. Just line up the subject in the Dot Sight at a normal field of view to easily track it at extreme magnifications. The new ML-L7 Remote Control allows various camera functions, such as zoom, aperture, ISO and the COOLPIX P1000s shutter to be triggered remotely without disrupting the camera and your composition during super telephoto shooting. Refers to wireless technology and wireless communication. In photography, it's most commonly the wireless transmission of images directly from a camera to a computer in order to achieve a swifter workflow. Based on Camera and Imaging Products Association (CIPA) standards for measuring the life of camera batteries. Measured at 23(-/+2)°C (73(-/+4)°F); zoom adjusted with each shot, flash fired with every other shot, image quality set to Normal, image size set to 4608 x 3456 (16M). Battery life may vary depending on shooting interval and length of time menus and images are displayed.